Have a little Disney fan? 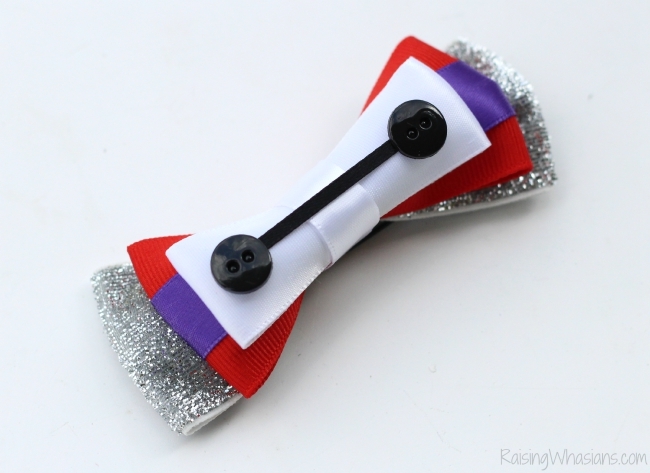 Make your child this Easy No Sew Baymax Hair Bow DIY to show off your Disney style! May contain commissioned links. So. Much. Cuteness! I’ve always had a weakness for 2 things, little girls and hair bows. If you want to see me melt into a puddle of love, insert an adorable girl and hair bow combo. I’ve always wanted to make pretty girl hair accessories myself, but as you all know, Christie can’t sew to save her life. Inspired by my latest D23 EXPO trip and of course, my adorable daughter, I created this ADORABLE No Sew Baymax Hair Bow DIY that is perfect for a little dress up or just everyday Disney love! Ready to melt into a puddle of love? 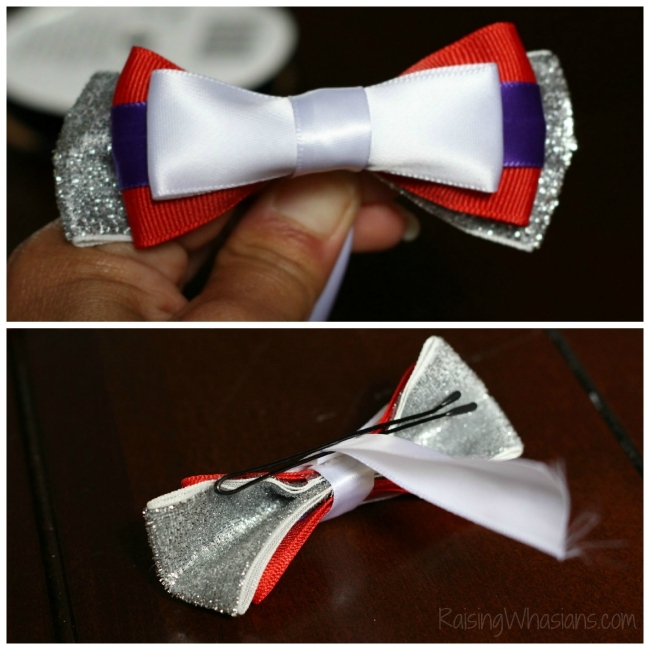 See how easy it is to make your own adorable Disney inspired hair bow! It’s no secret that Big Hero 6 is one of my favorite Disney animated movies like ever. Seriously, how can you not love that huggable squishable guy? And with a BIG D23 Expo trip just around the corner, I definitely was feeling the Disney inspiration. You bet, I have a few tucked away in my suitcase to bring along for my California visit. Any guesses on one of my Disney bounding outfits yet? 🙂 Ok, so here’s how to make this awesome bow. Seriously, I was able to knock one out in 10 minutes. You can too! 2. 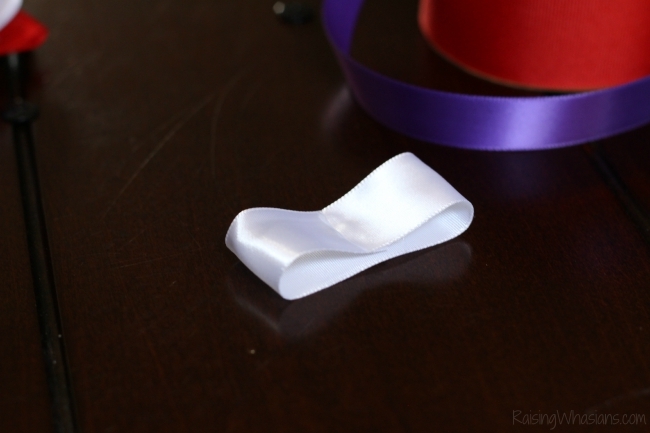 Glue the ends of the 5 inch white ribbon together with slight overlap, making sure the seams match up well. Once your circle is set, place the seam on the bottom. Add a touch of glue in the middle of the circle and press down, creating a pinch in the middle of your bow. 3. 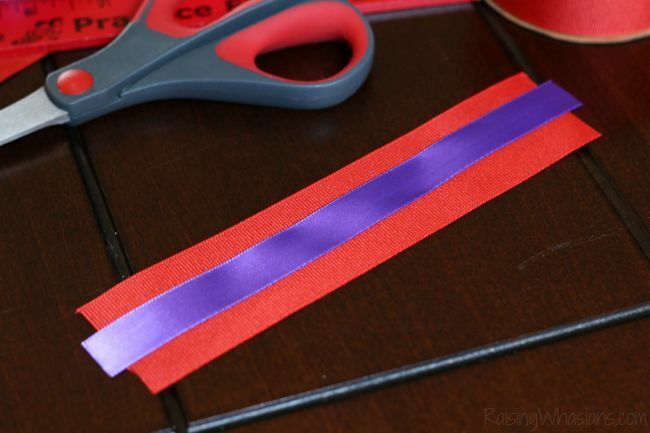 Now we’re going to glue the ends of the red and purple ribbon together. Place the purple ribbon in the middle of the red ribbon. Glue just the ends of purple ribbon on top of the red ribbon. You should now have an even stripe down the center of the red ribbon. 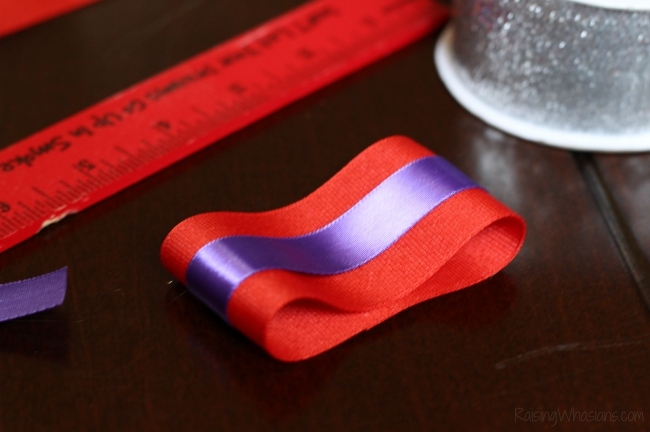 Glue the ends of the red ribbon together with slight overlap, making sure the seams match up well. Once your circle is set, place the seam on the bottom. Add a touch of glue in the middle of the circle and press down, creating a pinch in the middle of your bow (sane as your white ribbon). 4. 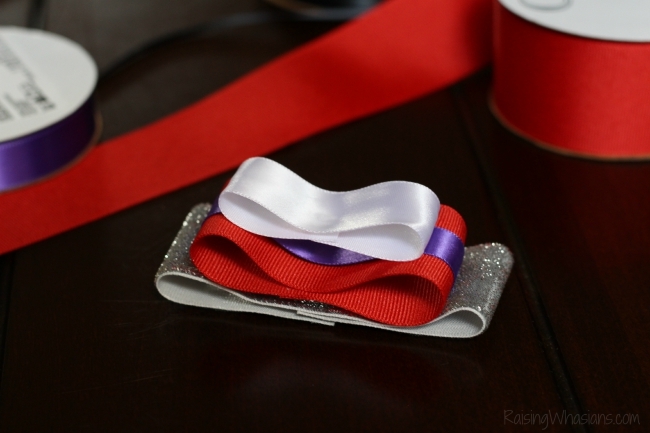 Glue the ends of the silver ribbon together with slight overlap, making sure the seams match up well. I needed extra glue for this ribbon since the sparkles were more difficult to glue. Once your circle is set, place the seam on the bottom. Add a touch of glue in the middle of the circle and press down, creating a pinch in the middle of your bow. 5. Alrighty, now for the layering. 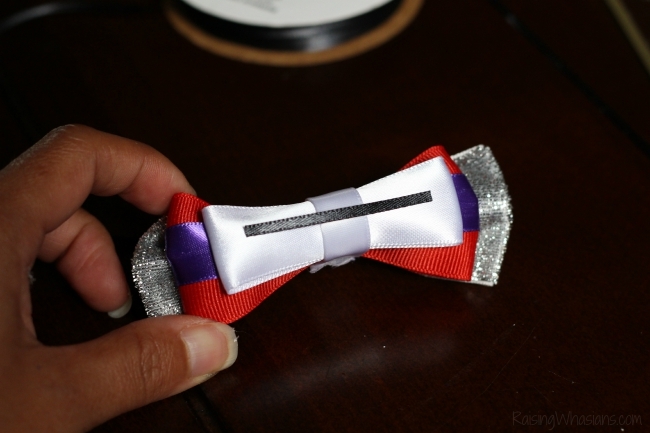 Place your silver bow on the bottom, non-seam side up. Now top with your red striped ribbon and white ribbon, making sure each bow is centered. Add a touch of glue to hold your bow together. Now turn the bow over. 6. The hardest part about this bow is getting everything to cinch well for that perfect bow look. Make sure you have plenty of glue for this. 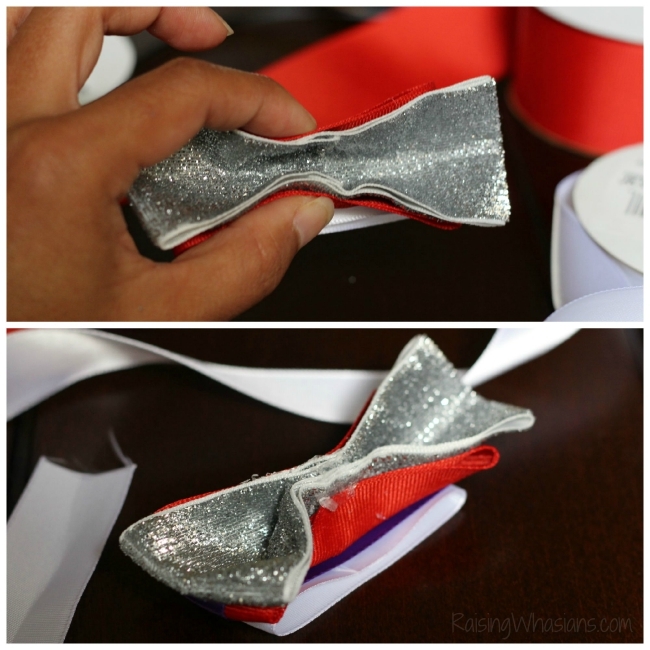 Seam side up, pinch the silver ribbon together in half. Add your glue to hold shut. Pinch and glue for the red stripe ribbon as well. Leave the white ribbon un-glued in the back. 7. Now take the 3 1/2 inch white ribbon and fold in half (if desired). Wrap around the entire bow tightly, gluing the first seam in the back. Add and adjust your hair clip in between the remaining ribbon to create your hair bow clip in the back. Glue the ribbon. Cut off excess. 8. 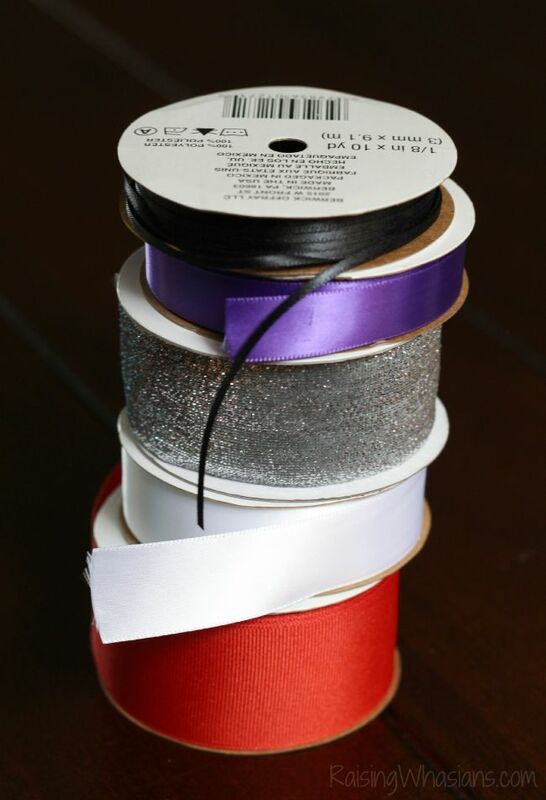 Take your 1 1/2 inch black ribbon and glue onto the top of the white bow, centered. 9. 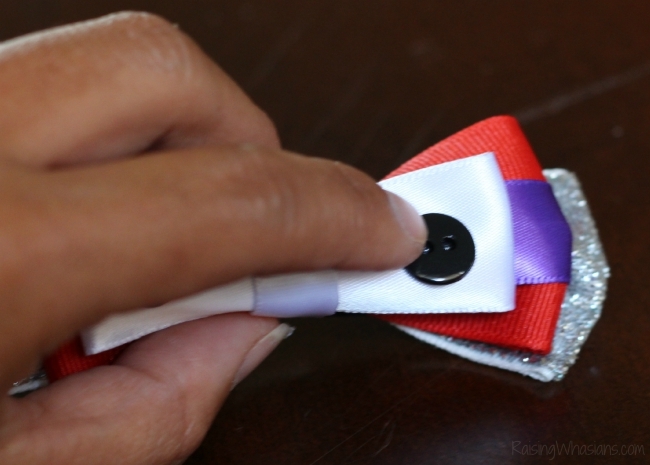 Glue on your buttons to the ends of the ribbon. Let my puddle of love commence. I can’t handle all of her adorableness. She could have asked for a pony at that point and I would have given it to her. I’m a complete mom sucker with that hair bow. 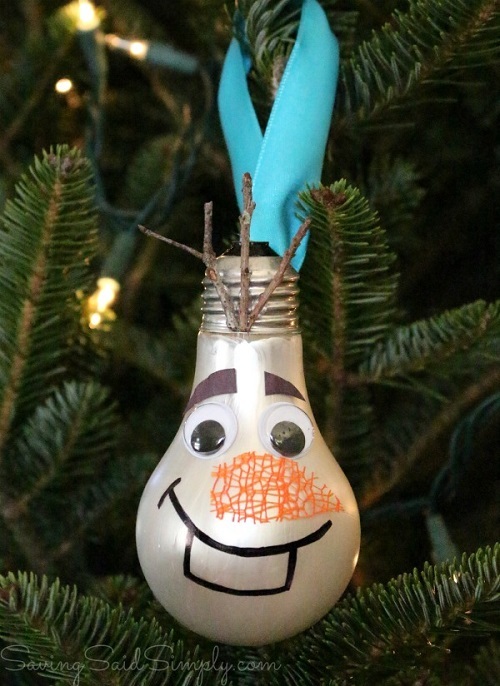 Need some more Disney crafting ideas? Check out some of my most popular Disney crafts! 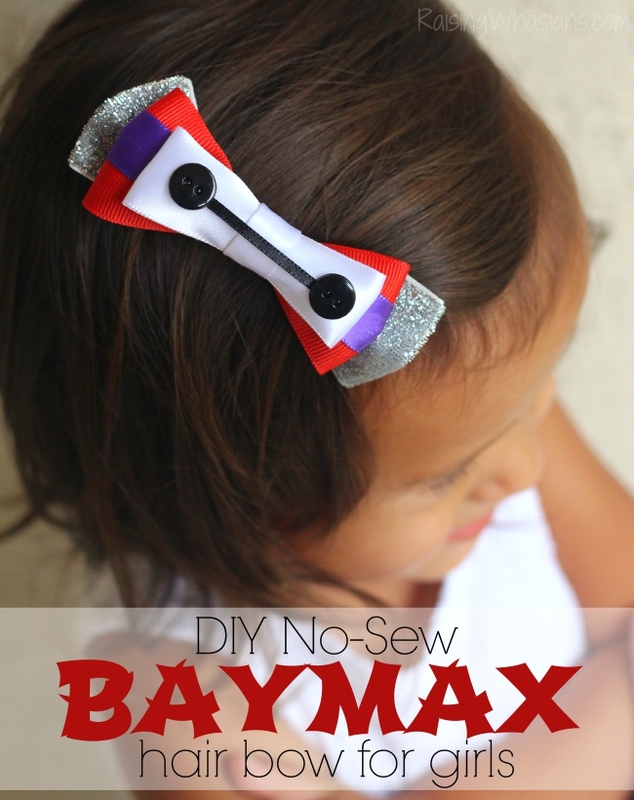 What little girl in your life would LOVE this DIY No Sew Baymax Hair Bow for Girls? Be sure to follow Raising Whasians via Facebook, Twitter, Google, Instagram, Pinterest and YouTube for more great recipes, crafts, travel and family moments! Oh, how cute, I totally love this DIY hair bow! I’m going to teach this for my little niece so we can make her lots n lots of it. Adorable now! Plus you have the cutest little model!! That is way cute. My niece would love it. That is adorable. My youngest would love that. Your bow turned out so cute. I used to make bows like this for my daughter but she would never wear them. That is so cute! I will have to make one for my granddaughter. What an adorable idea! My kids recently watched Big Hero 6 with my sister and brother in law and everyone really enjoyed the film. I am not a crafty person but I am going to try making these bows! Oh that is just the cutest bow. I love seeing Baymax’s cute face on it! This is adorable. My daughter would sure love to help me make some of these for her to wear. Coming from someone that can’t sew this is FANTASTIC! My daughters will love this. very cute, and my style, since I never took sewing classes in grade school! What a cute bow! Definitely captured baymax in the use of colors! Super cute!! This is so cute I will be making these with my daughters soon..
That is adorable. I love how easy it is too! Great idea. This is absolutely adorable! What a creative and simple idea. Awe! That’s such a cute bow! And I love that it’s no sew since I have yet to master the sewing machine! What a darling bow! You gave really great step by step directions as well. These are so cute and easy to make. They would have been perfect when my Daughter was in Cheer. First, congrats to the brand revamp…I almost didnt realize you changed it but change is good! 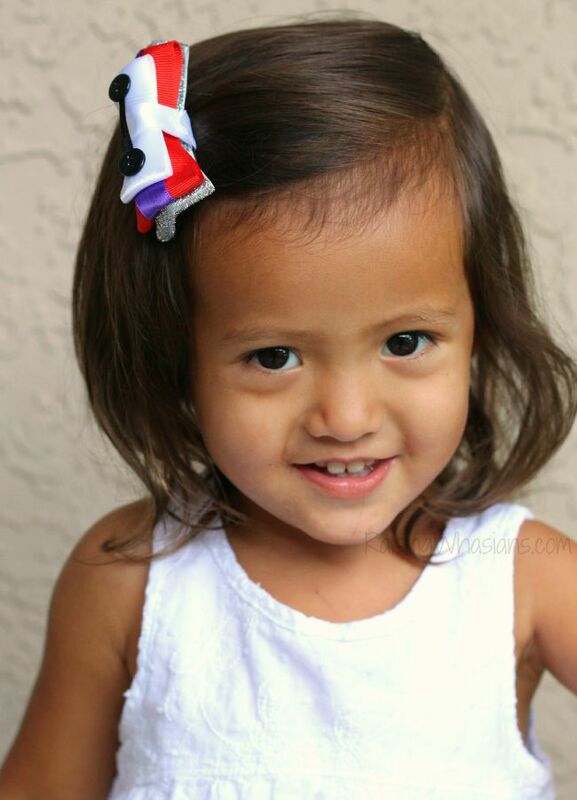 Also this DIY hair bow is adorbs and so is your daughter! What a cute bow! 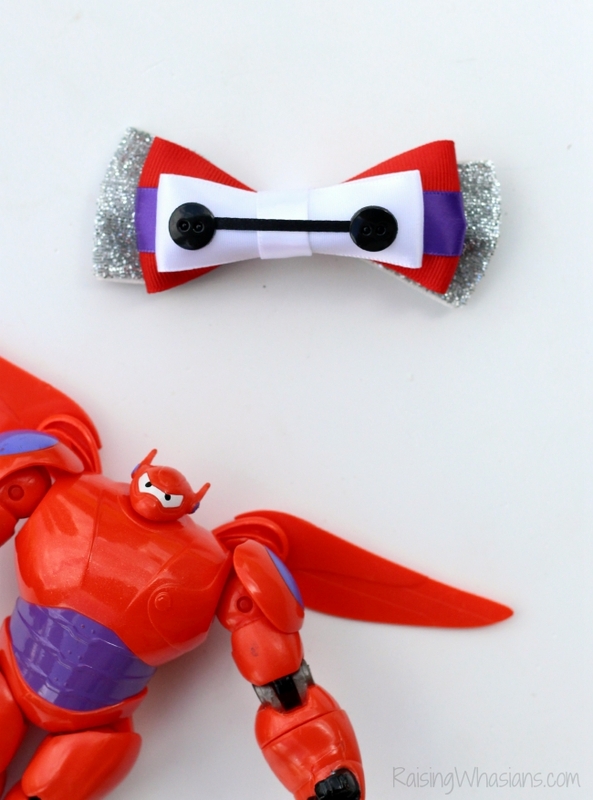 We are all fans of Big Hero 6 here, and I know my nieces would adore me if I made bows for them. 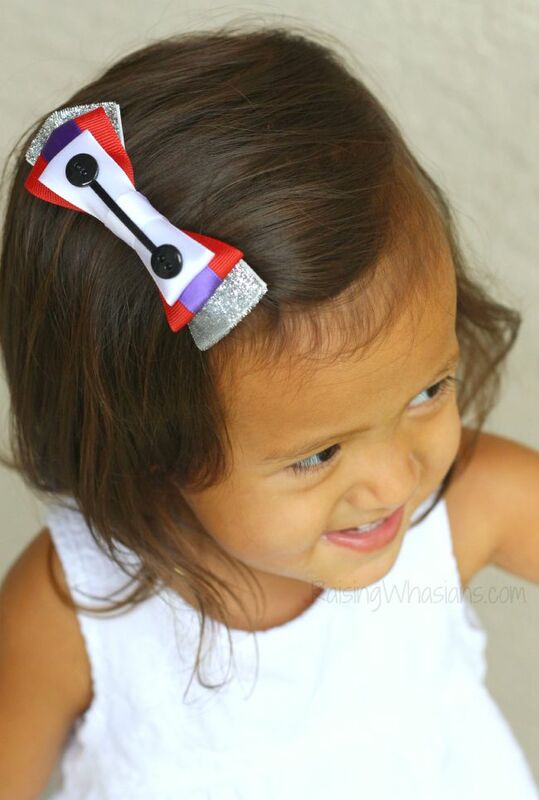 This DIY Baymax hair bow for girls is adorable!! I pinned this right away!! I know my young granddaughters would be so proud of themselves if they made this & also brag about it while wearing it!! I love that there isn’t any sewing!! Oh my goodness this is too cute! I am going to have to make one of these for my niece for her trip to Disneyworld next year! Adorable! This idea is simple,but so great! This is such a cute idea. My granddaughter is nearly 2 years old and I want to craft her a few. I can’t wait to get started. This is such a cute idea and such an adorable bow!! I love how easy it is, I can’t wait to make one with my daughter too! these are so cute . 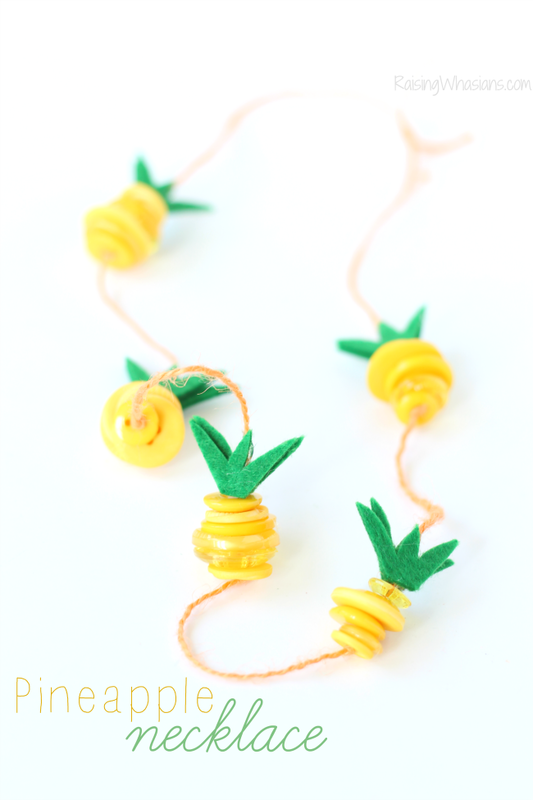 i love these and i can make alot of these under 30 minutes, even the kids can help. That came out nice! I like to make fabric flower accessories including headbands & hairpins – kids love wearing them!